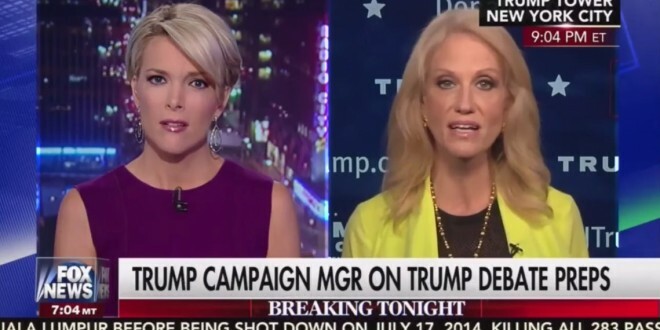 Megyn Kelly Rips Into Kellyanne Conway Over Trump's History Of Misogynistic Comments [VIDEO] - Joe.My.God. This is one interview that stands above the rest in a sea of truly intense Election 2016 interviews. As you’ll recall, Megyn Kelly was dragged through the mud by Donald Trump for well over a year because she asked about his history of misogynistic quotes during a primary debate. Eventually, Fox News itself had to get involved and defend its star host. Knowing that he is capable of that didn’t stop her from engaging his campaign manager Kellyanne Conway on the same topic tonight. Conway was the one who brought up “a couple of comments he’s made over 25 years or so with respect to women,” which Kelly pounced on. “Kellyanne, come on,” Kelly said when the campaign manager complained that Hillary Clinton‘s ads against Trump weren’t nice. She reminded Conway that presidential campaign ads aren’t supposed to be nice and, moreover, that the ads Clinton is running to highlight Trump’s negativity toward women use his words. Next, she rounded on Conway’s previous assertion about misogynistic comments made over 25 years. “You know that’s not true. You know he has repeatedly made comments about women — about their looks, about their size.” She brought up his looks-based attacks on Carly Fiorina and Heidi Cruz only to be dismissed by Conway.